WASHINGTON —U.S. President George W. Bush approved a Defense Department plan to try andshoot down a crippled spy satellite after becoming convinced that the spacecraft?stoxic hydrazine fuel posed an unacceptable risk to people on the ground, seniorU.S. government officials said at a Pentagon press briefing Feb. 14. Controllerslost contact with the classified satellite shortly after its Dec. 14, 2006,launch and U.S. government officials recently acknowledged its orbit isdecaying and that it would re-enter the atmosphere sometime in March. In orderto prevent the satellite?s hydrazine fuel tank from coming down intact andpossibly dispersing highly toxic fumes over an area roughly the size of twofootball fields, U.S. officials will take the extraordinary step of attemptingto shootit down just before it re-enters. A direct hit to the spherical tank, whichmeasures about 40 inches (100 centimeters) across, would result in the hydrazine beingdispersed in the atmosphere and posing no hazard on the ground, the officialssaid. Theintercept attempt, which will involve a Standard Missile 3 fired from a U.S.Navy Aegis ship, will take place during a window that opens after NASA?s spaceshuttle Atlantis returns from its International Space Station-constructionmission Feb. 20 and will remain open for several days. The window was selectedbased on the satellite?s current re-entry trajectory and the U.S. government?s desire to minimize hazards in space, in the air and on the ground. U.S. MarineCorps Gen. James Cartwright, vice chairman of the Joint Chiefs of Staff, saidthe intercept, if successful, will take place at a low enough altitude tominimize orbital debris. Cartwright, along with NASA Administrator Mike Griffinsaid well over 50 percent of the debris from a successful intercept willre-enter and burn up in the atmosphere within two orbits, or 10-15 hours, whilethe remainder would come down within a matter of weeks. Satellites typicallyoperate at altitudes higher than the debris is expected to reach. Theinternational space station orbits Earth at an altitude of around 199 miles (320kilometers). Griffin said the intercept is expected tooccur at an altitude of about 149 miles (240 kilometers). He noted that the controversialanti-satellite test conducted by China last January occurred at an altitude ofsome 528 miles (850 kilometers) and much of the resulting debris will remain in orbit for20 or more years. AmbassadorJames Jeffrey, President Bush?s deputy national security advisor, said anotherdifference is that the United States is informing the international communitywell in advance of the attempted shoot-down. He emphasized that the motivationbehind the test is to protect lives on the ground and that the action does notviolate any U.S. treaty obligations. Cartwrightsaid he was confident in the intercept?s chances of success. 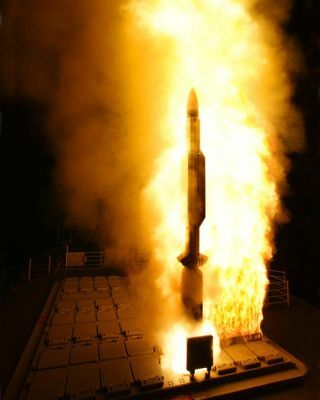 The StandardMissile 3 and Aegis system, developed for the sea-based component of the U.S. missile defense architecture, are both well understood. He said the software on themissile and the ship-based Aegis targeting system will have to be modified forthe attempt. Cartwrightcharacterized the modifications as reversible actions that are being donestrictly for what he characterized as a one-time-only event. The modifications,he said, are ?not transferable to a fleet configuration.? Theintercept?s location will be chosen to maximize the chance that any debris thatsurvives the kinetic impact of the missile and re-entry will land in the ocean,Cartwright said. The satellite and missile will close on one another at avelocity of about 22,783 miles (36,667 kilometers) per hour. Even if the kinetic interceptoronly grazes the satellite it is likely to force it to re-enter the atmospheresooner than otherwise would have been the case. Theoperation will involve three ships and two backup missiles, Cartwright said. Heoutlined two possible scenarios in which the backup missiles would be used, oneinvolving a failure of the primary interceptor to launch. If the first missilelaunches but misses the satellite, a second shot might be attempted dependingon the likelihood that it can be pulled off in a location that likely wouldresult in the debris falling harmlessly at sea. After thefirst shot is attempted, the Pentagon will use its network of ground andspace-based sensors to assess whether it scored a hit. In the case of a miss, asecond shot, if attempted, could take place some two days after the first. Thesatellite, a test craft owned by the secretive U.S. National ReconnaissanceOffice, weighs about 5,015 pounds (2,275 kilograms), Cartwright said. U.S. officials estimate that about half of the hardware would survive the fiery re-entryand plunge to Earth, he said. Cartwrightinsisted there was no concern that the satellite?s sensitive, classifiedtechnology would survive re-entry and fall into the wrong hands, and said thedecision to attempt the shoot-down was driven strictly by safetyconsiderations. ?This is all about trying to reduce the danger to humanbeings,? he said. Cartwrightsaid satellites of this size — he said it is about the size of a bus — havere-entered throughout the space age, but few have done so with a full load ofhydrazine. Thehydrazine tank aboard the failedsatellite is about the same size as the one that was aboard the doomedspace shuttle Columbia. The tank landed intact in an unpopulated wooded area in Texas after the orbiter broke up on re-entry in 2003. Griffin said analyses have concluded thatit is all but certain that the hydrazine tank aboard the crippled satellitewill land intact if no action is taken. The tank will be breached and full ofslushy hydrazine, which will evaporate and dissipate over the immediate area,he said. If this occurs in a populated area it could result in injury or evendeath, officials said. Theofficials said the decision to attempt the intercept was based on a simple riskassessment. The outcome of a failed intercept will be no worse than if therewas no attempt at all, they said. A successful intercept, they said, wouldresult in reduced risk to people on the ground.